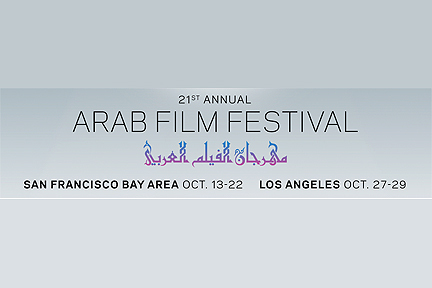 The 22nd San Francisco Arab Film Festival screens 12 – 21 October 2018. This year’s opening night film is Heaven Without People directed by Lucien Bourjeily (2017) Lebanon. Subsequent narrative and documentary features will screen at the Roxie Theater in San Francisco and the New Parkway in Oakland. The festival includes work from Algeria, Egypt, Iraq, Lebanon, Palestine, Saudi Arabia, Syria, Tunisia, and the US. For more information and tickets contact Arab Film And Media Institute. 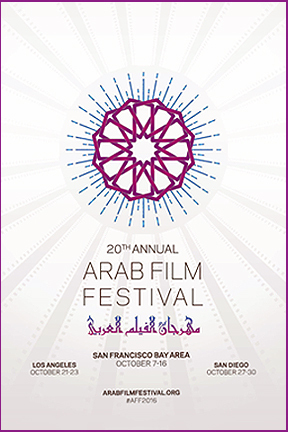 The Arab Film Festival 21 opens Friday 13 October 2017 at the Castro Theatre in San Francisco. Solitaire directed by Sophie Boutros (2016) Egypt/Jordan/Lebanon is the opening night film. Screenings continue in the Bay Area over the following nine days in San Francisco, Oakland, Berkeley, and Vallejo before moving to Los Angeles for an additional three days. I plan to see three dramatic features Saturday 14 October 2017 at the Roxie Theater: Bezness As Usual directed by Alex Pitstra (2016) Netherlands/Tunisia, Here I Am…Here You Are directed by Raed Rafei (2016) Italy/Lebanon, and In Between directed by Maysaloun Hamoud (2016) France/Israel. For more information and tickets contact Arab Film Festival. The twentieth annual Arab Film Festival opens soon in five California cities. San Francisco 7 – 11 October 2016, Oakland 12 – 14 October 2016, Berkeley 15 – 16 October 2016, Los Angeles 21 – 23 October 2016, and San Diego 27 – 30 October 2016. Clash directed by Mohamed Diab (Egypt) 2016 is the opening night film at the Castro Theatre. It will be preceded by a reception and followed by a party at Mercer featuring DJ Emancapacion. Subsequent San Francisco screenings will be at the Embarcadero Center Cinema. Very Big Shot directed by Mir-Jean Bou Chaya (Lebanon) 2015 is the opening night film at Harmony Gold in Los Angeles. Iraqi Odyssey is the opening film at the Museum of Photographic Arts in San Diego. This year’s festival includes narrative features, documentaries, and shorts from Egypt, France, Israel, Jordan, Lebanon, Morocco, Palestine, Syria, Tunisia, and Turkey. 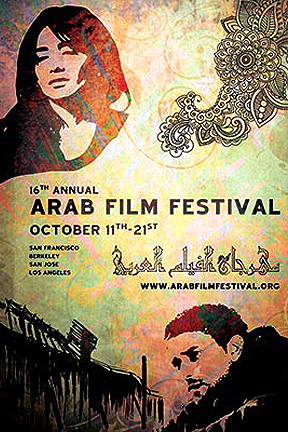 The 16th Annual Arab Film Festival opens Thursday 11 October 2012. The screenings will take place in San Francisco, San Jose, and Berkeley. Man Without a Cell Phone directed by Sameh Zoabi (Palestine, Belgium, France, Qatar) 2011 is the opening night feature at the Castro Theatre. Other festival films include: Another Night On Earth directed by David Munoz (Spain) 2012; Death For Sale directed by Faouzi Bensaïdi (Belgium, France, Morocco) 2011; Farewell Exile directed by Lamia Alami (Morocco, Switzerland, France) 2011; Letter To Sasha directed by Andoni Jaén and Javier Reverte (Morocco, Switzerland, France) 2012; My Name Is Not Ali directed by Viola Shafik (Egypt, Germany) 2011; Pegasus directed by Mohamed Mouftakir (Morocco) 2010; Private Sun (Palestine) 2011; Rough Hands directed by Mohamed Asli (Morocco) 2011; Teta directed by Merva Faddoul (Lebanon) 2011; The Virgin, The Copts, And Me directed by Namir Abdel Messeeh (France, Qatar) 2012; Words Of Witness directed by Mai Iskander (USA, Egypt) 2012; and Yamo directed by Rami Nihawi (Lebanon) 2011. For more information and tickets contact AFF. 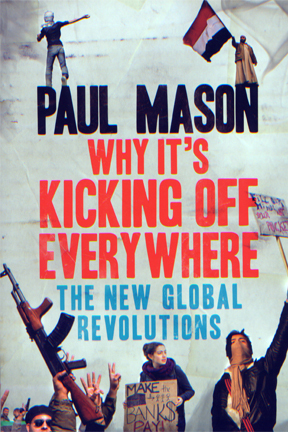 Why It’s Kicking Off Everywhere: The New Global Revolutions by BBC economics editor Paul Mason, Verso 2012 tracks the recent upheavals throughout the world. Millions of people recently took to the street protesting injustices. Tahrir Square in Cario. Syntagma in Athens. Unrest spread through several Arab countries and European capitals. Students, workers, and pensioners all joined in to protest harsh austerity measures while politicians and economists endlessly debated how best to preserve the assets of banks and multinational corporations. Paul Mason witnesses and reports from within and tries to make sense of it all. He interviews both the organizers and other participants. I admire his attempts to go to the source of those mass movements instead of remaining at a distance and spouting preconceived clichés. He records not only the words shouted but also includes the Twitter hashtags so that readers of his book can follow future developments in real time. In some instances I gained a better understanding of the complaints from a journalistic perspective. But in the end I finished the book wanting more: a deeper exploration and a wiser evaluation of the situation. However, for that one must look elsewhere.